The Book of Acts has much to tell us concerning the formation of local churches. In Acts 5:11 we read “So great fear came upon all the church….” The church mentioned here is a reference to the church in Jerusalem. On Pentecost Day the apostles had preached the Gospel and many had come to faith (Acts 2:41). However, those who came to faith did not remain as islands to themselves but rather sought each other out and met together. So we read in Acts 2:44 that “all who believed were together, and had all things in common” and in vs 46 we are told that they “continued together with one accord in the temple, …breaking bread from house to house….” Similarly, in Acts 4:32 we read, “Now the multitude of those who believed were of one heart and one soul; neither did anyone say that any of the things he possessed was his own, but they had all things in common.” The believers in Jerusalem formed one body and did things as one body. Together they formed the Church of Jesus Christ in Jerusalem. This church gets mentioned once again in Acts 8:1, “Now Saul was consenting to (Stephen’s) death. At that time a great persecution arose against the church which was at Jerusalem; and they were all scattered throughout the regions of Judea and Samaria, except the apostles.” The one church in Jerusalem was broken up through the persecution, so that Christians spread abroad. Like ripples on a pond, the believers at Jerusalem were spread abroad further and further, as far as Judea, Samaria, Galatia, (Acts 9:31), the two coastal cities Phoenicia and Antioch, and the island of Cyprus (Acts 11:19). First, in Acts 9:31 we read of churches: “Then the churches throughout all Judea, Galilee, and Samaria had peace and were edified ….” A footnote to this verse informs us that some manuscripts record “church” in the singular. The singular may well be the better reading, but the ambiguity of the textual witnesses indicates that one cannot build strong arguments either way on this text. Second, far more compelling is what the apostle Paul wrote in his letter to the Galatians. He writes in 1:13, “For you have heard of my former conduct in Judaism, how I persecuted the church of God beyond measure and tried to destroy it.” This text is a reference to the persecution he had begun in the church in Jerusalem, as recorded in Acts 8:1. Note the singular; Paul speaks about “the church in Jerusalem”. The apostle goes on to relate that God called him through His grace (i.e. on the way to Damascus), that he then went on to Arabia, returned to Damascus, and so didn’t go back to Jerusalem to see Peter till three years later (Galatians 1:15-20). Striking, now, is how Paul describes the ecclesiastical scene after three years had passed. For Paul says of himself that he “was unknown by face to the churches of Judea which were in Christ” (Galatians 1:22). Note the use of the plural. Note also that “the church in Jerusalem” has changed to “the churches of Judea”. The conclusion follows: as a result of the persecution of the church in Jerusalem, this one (large) church was scattered into various (smaller) churches throughout Judea. Acts 11:26: “And when (Barnabas) had found (Saul), he brought him to Antioch. So it was that for a whole year they assembled with the church and taught a great many people. And the disciples were first called Christians in Antioch.” Note that the church in Antioch is described as a complete body in itself, and not a part of a wider, regional church. Acts 14:23: After Paul and Barnabas had preached the Gospel throughout Asia Minor, “they returned to Lystra, Iconium, and Antioch” and “appointed elders in every church.” Here we read of a plurality of churches, one per town, and not of a single regional church. Acts 15:41: “And (Paul) went through Syria and Cilicia, strengthening the churches.” Again, not one church, but many churches. Acts 20:17:”From Miletus (Paul) sent to Ephesus and called for the elders of the church.” To these elders Paul gave this charge: “Therefore take heed to yourselves and to all the flock, among which the Holy Spirit has made you overseers, to shepherd the church of God which He purchased with His own blood” (vs 28). These elders were made overseers of the flock in Ephesus (and not the flock in Antioch or in Jerusalem), and this flock in Ephesus is “the church of God which He purchased with His own blood” – complete in itself. 1 Corinthians 12:27: Paul describes “the church of God which is at Corinth” (1 Corinthians 1:2) as “a body of Christ”. That is: this church in Corinth is a complete body in itself. By extension, each church in any given community is a complete body. The term ‘church’, then, is not to conjure up in our minds the notion of a regional or national entity of which each local church is a subset. The evidence of Scripture indicates instead that each local church is a complete church in itself. Believers who had been scattered by the persecution in Jerusalem had passed on the Gospel not only to other Jews but also to Gentiles. Under God’s blessing, many Gentiles came to faith. When it was heard in Jerusalem that Gentiles in Antioch had been converted to the Christian faith (let the reader recall that Jews were conditioned to keep the gospel for themselves; that’s why Peter needed the vision of the clean and unclean animals, Acts 10), the church at Jerusalem sent out Barnabas with the mandate “to go as far as Antioch” (Acts 11:22). The words “go as far as” suggest that Barnabas was not to travel directly to Antioch to investigate developments there, but was instead to touch base with various of the churches along the way, till he finally ended up in Antioch. Of significance to our topic is the fact that the church at Jerusalem displayed an interest in what was going on in other churches. The church in Jerusalem did not consider itself an island unattached to and uninterested in the other churches; the church in Jerusalem instead recognised that there was a bond of faith between the various churches. Acts 11:27-30 also tells us of prophets from Jerusalem going out to Antioch. One of them, Agabus, prophesied a severe, extensive famine which caused a need for assistance in Judea. In response to this prophecy, the believers in Antioch sent relief along with Barnabas and Saul to the elders in Judea. In so doing, they displayed an attitude of care to those with whom they shared a bond of faith. The same attitude was evident amongst the churches in Macedonia and Achaia. Even though they were very distant from the church at Jerusalem and didn’t know the brethren there, “it pleased those from Macedonia and Achaia to make a certain contribution for the poor among the saints who are in Jerusalem” (Romans 15:25,26). Paul set this deed of the Macedonian brethren as an example before the church at Corinth: “Moreover, brethren, we make known to you the grace of God bestowed on the churches of Macedonia: that in a great trial of affliction the abundance of their joy and their deep poverty abounded in the riches of their liberality. For I bear witness that according to their ability, yes, and beyond their ability, they were freely willing, imploring us with much urgency that we would receive the gift and the fellowship of the ministering to the saints” (2 Corinthians 8:1-4). Further on in his letter (2 Corinthians 9:1-5) Paul encourages the Corinthians also to give for the benefit of the needy in churches outside of Corinth. The Thessalonians likewise made it their business to help out the brethren who lived elsewhere in Macedonia. Paul encouraged the saints of Thessalonica, “But concerning brotherly love you have no need that I should write to you, for you yourselves are taught by God to love one another; and indeed you do so toward all the brethren who are in all Macedonia” (1 Thessalonians 4:9,10). Paul writes to the saints in Rome, “I commend to you Phoebe our sister, who is a servant of the church in Cenchrea, that you may receive her in the Lord in a manner worthy of the saints, and assist her in whatever business she has need of you; for indeed she has been a helper of many and of myself also” (Romans 16:1,2). Similarly, we read in Acts 18:27 of Apollos receiving an ‘attestation’ when he travelled from Ephesus to Achaia: “And when he desired to cross to Achaia, the brethren wrote, exhorting the disciples to receive him; and when he arrived he greatly helped those who had believed through grace.” That letters of commendation were written concerning a member travelling to another church demonstrates that the churches considered themselves united to others through the bond of faith. In sending each other greetings, the churches gave expression to the fact that even though they were separate churches, they recognised each other as sister churches in Christ, united by their faith in Him. For that reason the apostle John concluded his second epistle, “The children of your elect sister greet you” (2 John: 13). Equally, to the church at Rome Paul writes, “The churches of Christ greet you” (Romans 16:16). And to the Corinthians: “The churches of Asia greet you” (1 Corinthians 16:19). 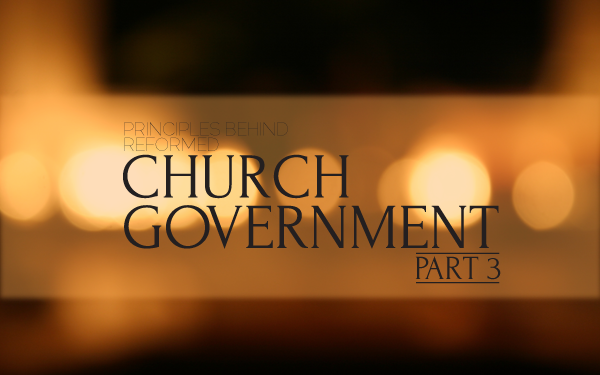 This is part 3 of a 4 part series on the government of the Church.